Remember all that talk about buying local? Supporting our neighbors instead of overseas labor… The Patchwork Show was in town this weekend, the affair involved people buying crafts made by people. 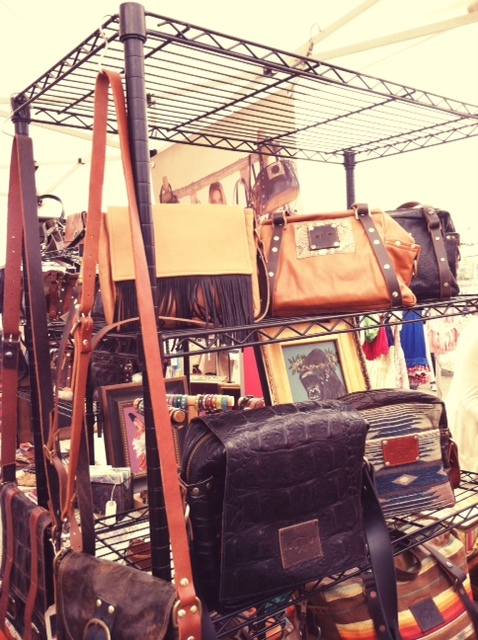 The vendors were with us selling and talking up their hand-made, or at least hand-sourced goods. I tried making friends with everyone and asked lots of questions, because I enjoy making friends and asking questions. What is in style? If you haven’t noticed: negative space, arrows and chevrons, pale OR neon, raw, and simplicity. 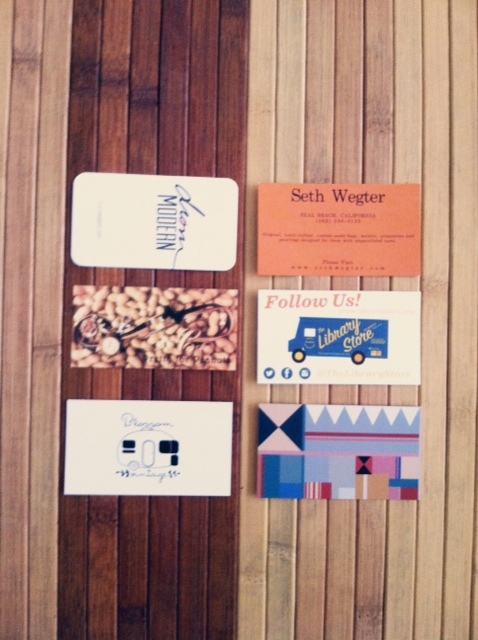 Just glancing at these business cards proves said trends true. 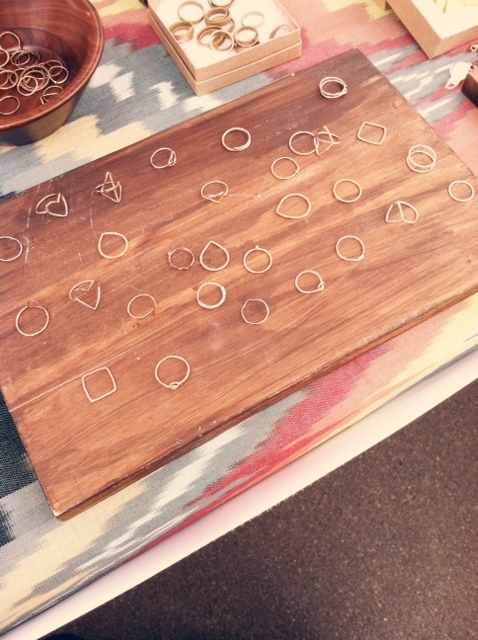 If I had between $30-$50 to spare these nikki montoya rings would be all over my fingers. 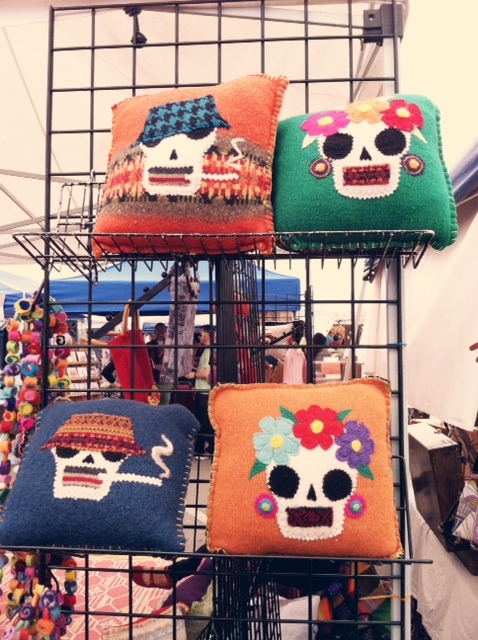 These crafty skulls screams: “I am creative yet badass because I support the cute and felted, oh and skulls!” My favorite is Mr. Smoker. This style is now all the rage, but I hope you know their true origin comes from Dia De Los Muertos, the post-Halloween Mexican Holiday. 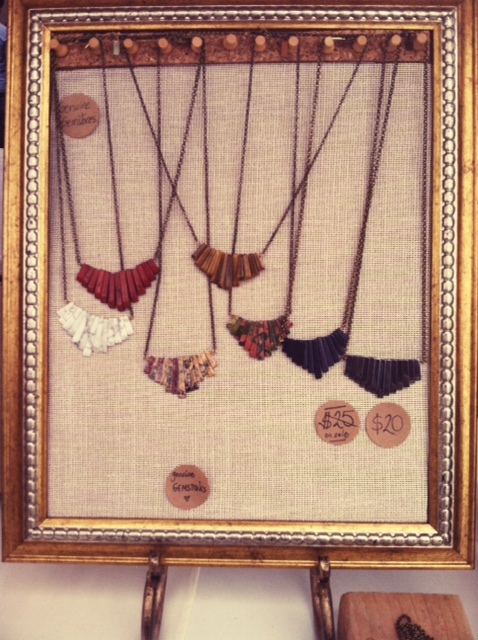 These handmade necklaces come in an assortment of natural colors to match the wearer’s unique style. I bought a turquoise one (not pictured) because my usual neutral get-ups could use a color pop. 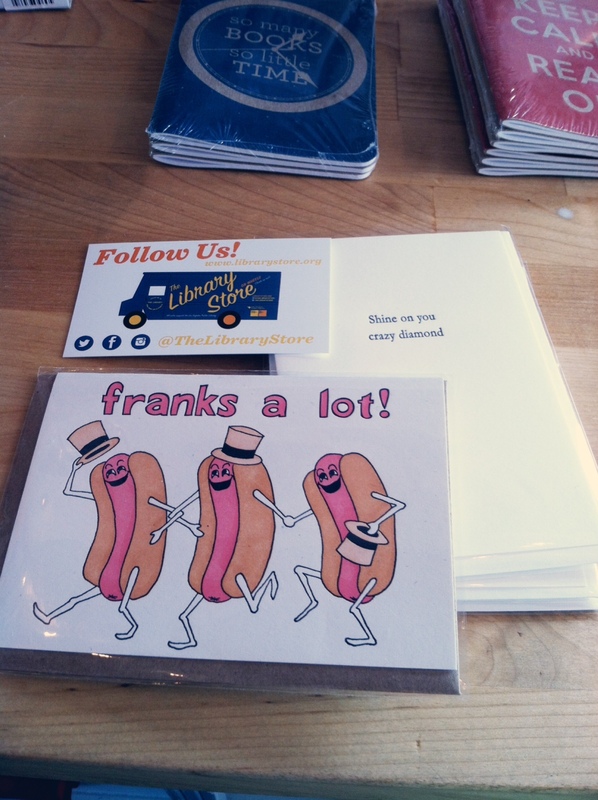 Frankly, my dear, this card is adorable. As a DIY-er I say, “go make one yourself dammit!” But as an appreciator of the creative and talented, I say support The Library Store! 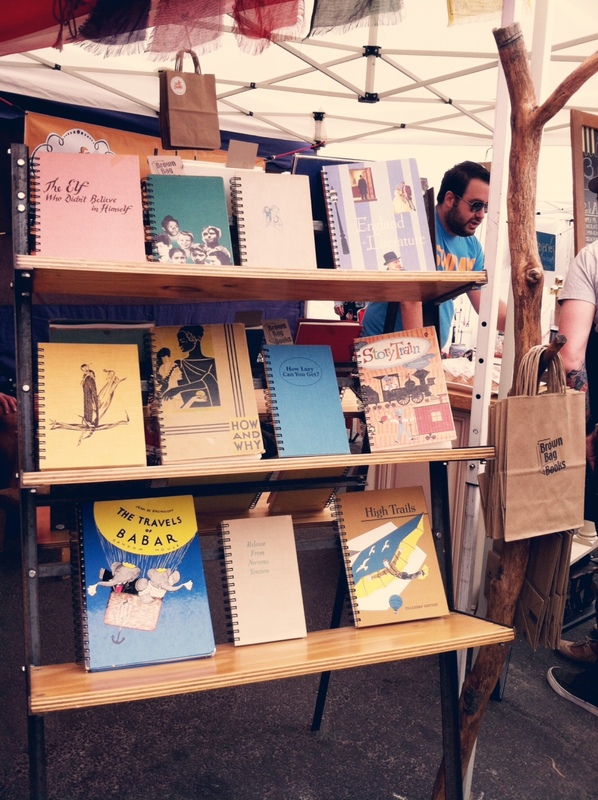 Seth Wegter is a very attractive young man who makes his own bags. You should read his about me, it is very inspiring, apparently he is also a wrestling coach. I used the line “wrestling wasn’t manly enough so you decided to also make bags?” He probably laughed out of courtesy, he has also probably heard that line more times than a zebra with a sunburn being told he’s red all over. These extremely attractive bags have that vintage flavor but are instead clean, made local, and smell like leather instead of grandma’s closet. It’s a win-win-win! Ah yes the recycled book journal, one of America’s new favorites. (I have found a way to make these that actually still looks like a real book – coming soon!) These vacant reads are everywhere now, go on etsy, go on pinterest, you’ll find one. They are simple-ish to make, and terrific for a lover of nostalgia because you can make or find a journal with any sort of theme on its front cover. The experience is similar to finding an old book at a bookstore and judging the heck out of the cover, but instead of reading it you get to write your own tale. Or, you know, use it as a journal. This little guy is just too cute. 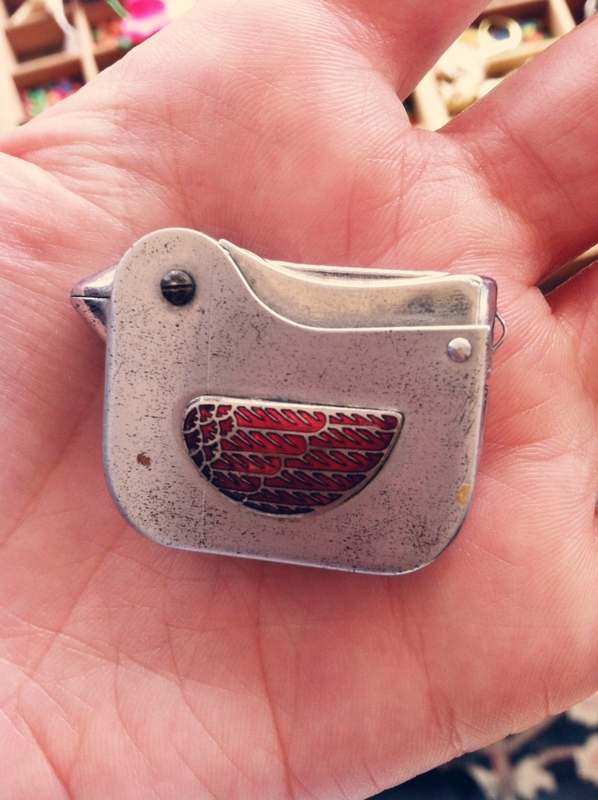 He’s an old lighter in the shape of a bird, metal with red turquoise wings. The lighter fuel has run out but if I were fixing for a mission I would have bought him up and solved the issue. Any experts on vintage mini lighters out there care to share some advice? « Summerbaby, show me the town. Hi Lisa, thank you so much for the mention & sweet words! I just found your blogpost via google search 🙂 Hope to see you at this years patchwork show as well! yay I’m glad you found it! You’re so welcome 🙂 I hope the business is going well!